Today is my birthday. My friends gave a surprise birthday party for me, something I’ve never had before! It was so much fun and truly a surprise. My sisters have another celebration waiting for me, which will happen next weekend. And I’m going out with friends tonight, so the party keeps going. I’ve been thinking about this birthday because it’s older than I ever thought I would be, in my smug youth, and because I realized I’m not much younger than my mother was in this picture. I thought she was so old then! And now it seems just another stage to me. I think the big difference may be health. Mother had a couple of heart attacks which were not diagnosed at the time, and when this photo was taken she was in the early stages of heart failure. We didn’t know, of course. I had driven to Tennessee from Atlanta to get her, and we drove down to St. Augustine and Daytona Beach. Mother had never been to Florida and never seen the ocean. 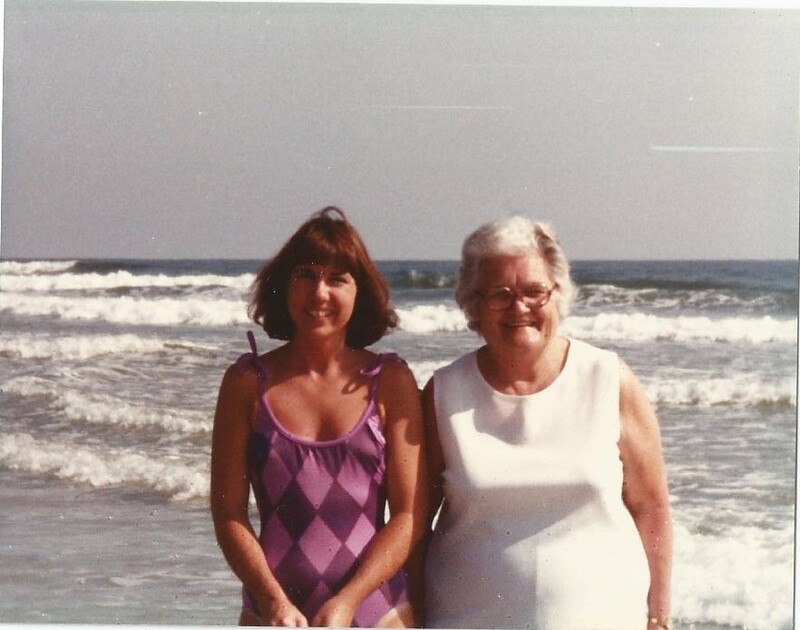 This was after Labor Day, in early September, 1981, so the summer crowds were gone, and she enjoyed sitting on the beach at Daytona talking to “snowbirds” who were around her age. I took her to Sea World, and she could barely walk from one show or exhibit to the next. She was exhausted all the time. When I got her back home, I called one of my sisters and said, “Something’s wrong with Mother.” Glenda took her to a different doctor, and the damage was diagnosed. I’ve been conscious of how heart disease affects women, particularly women in my family, ever since. Heaven knows I don’t do as much as I could to stay healthy, but I do try. And I think I’ve had much better medical care than she did. Another difference from my mother is purely cosmetic–thanks to every colorist I’ve gone to for years, my gray goes away! I have to keep working, and I want to keep working, so I can’t afford to go gray. Sad, but true. Mother thought of herself as “old” from a relatively young age. I remember her telling me she was old when I was about 12, so she would have been 50! Standards were different in her day. I do think we all pursue continued youth too hard sometimes in this day and age. Things do change, we do slow down a bit, we do get tired more easily. But we don’t have to stop. As long as our health holds up, my friends are active and interested and still engaged with the world. I plan to be, too.